Performers include: Alfonso Herrera, Ben Daniels, Kurt Egyiawan, Geena Davis, Alan Ruck, Brianne Howey, and Hannah Kasulka. This psychological thriller TV series is based on the horror feature film from 1973 which itself was based on the 1971 novel by William Peter Blatty. The story follows two very different priests as they tackle one family’s case of a horrifying demonic possession. 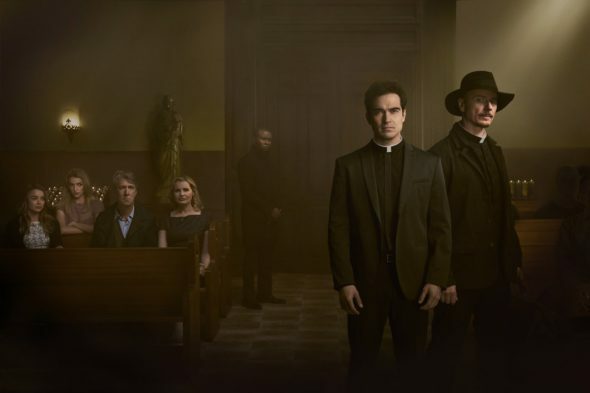 Father Tomas Ortega (Alfonso Herrera) is the new face of the Catholic Church. He’s progressive, ambitious and compassionate. Father Tomas runs a small, but loyal, parish in the suburbs of Chicago and he has no idea that his quiet life is about to change forever. Father Marcus Keane (Ben Daniels) is a modern-day Templar Knight. He’s an orphan who was raised by the Vatican to wage war against its enemies. He is everything Father Tomas is not — he’s relentless, abrasive and utterly consumed by his mission. Father Marcus constantly butts heads with his adversary within the church, Father Bennett (Kurt Egyiawan). Caught in the middle of these two very different priests is the Rance family, members of Tomas’ parish. On the surface, they’re a normal, American family, but all is not as it seems in this household. Henry Rance (Alan Ruck) is the patriarch and is recovering from a traumatic injury. Eldest daughter Katherine (Brianne Howey), formerly a ballet dancer, has become a recluse who refuses to leave her room. Her younger sister, Casey (Hannah Kasulka), thinks she’s hearing strange noises coming from inside the walls. Their girls’ mother, Angela (Geena Davis), believes there is something in the house — a demonic presence, growing stronger by the day. Desperate for help, she begs Father Tomas. Unwittingly, she sets the naïve young priest on a collision course with Father Marcus. Separately, Tomas and Marcus face an insurmountable task. Together they become the Rances’ only hope against an evil force that has been mobilizing for centuries. What do you think? Do you like The Exorcist TV show? Do you think it should have been cancelled or renewed for a third season? Please pick this show up Netflix of Amazon Prime! This was the only supernatural/demon TV show that was actually scary! I want the show back!!! I totally agree!!! I absolutely LOVED this show and am truly disappointed it’s being cancelled. This was an awesome series! Great writing, acting, directing, and special effects! The story plots for season one was amazing, only followed by another amazing season 2!! Bring it back please! Truly this show was unexpectedly great! I’m not a horror fanatic and still am in love with the show. Just saw Ben Daniels in an older series and googled Exorcist. Really disappointed to learn it wasn’t renewed. Wish someone had picked it up. Any chance? I think it’s a great show. What’s wrong with fox, they also canceled Lucifer which got picked up by Netflix for season 4. Maybe they’ll pick up the Exorcist. Definitely one of best tv shows. Why are always the best shows, that are csncelled?! Exactly the always cancel the best.